If you asked me to recommend one place for your family to visit, it would be Roatan Island, off the eastern coast of Honduras. We spent 18 days on this island and our time was filled with adventures and lifetime memories. We never said we travel light. One of our first impressions of Roatan - Reuse and recycle is a necessary part of island life. All groceries are boxed. No bags, plastic or paper, are available at the grocery store. We stayed in the town of West End, as opposed to the similarly named town of West Bay. West Bay is known for it's big hotels, amazing beach and big tourist operations. West End, on the other hand, has plenty of smaller hotels, several dive shops, and a nice beach. We rented a house, with a full kitchen, 100 feet from the main drag, with access to a pool. A fresh fruit and vegetable truck drove by daily. There was also fresh fish available daily by a guy that caught it that morning (at least that's what he said). There were several places to swim, but we often chose to play around the dock at Rudy's Shack after eating pancakes or drinking chocolate banana milkshakes. Tag enjoyed petting several of the dogs that came to the shack with Rudy's owner. West End - Hanging out on Rudy's dock, The main road is just beyond the blue and white umbrellas. Our views from West End at dusk. Ken took the kids paddle boarding in Half Moon Bay in West End. The sailboat in the background is damaged and permanently anchored there. Many locals play on it. There's a rope swing hanging from it which Ken and Tag enjoyed. Ela and I earned our Scuba Diving Certification, and Ken got his renewed with a refresher dive...more about this in our next post. All geared up and ready to go down under! Learning to scuba dive with Ela was an experience I will treasure for the rest of my life. The kids and I spent a day at Gumbalimba Park. Sadly, Ken was working. Luckily, it was a non-cruise ship day, and we, literally, had the park to ourselves. Our entrance fee even included a guided tour. We explored the Insectarium and cheesy pirate cave. There were lots of interesting facts. The kids made me take several pictures factoids and dead insects. Next we watched the activity in the Iguana Nest. Then, the fun really began. It started with us getting to know the macaws a little better. ollowed by at least 30 minutes of playing with the White Faced Monkeys. Because we had the whole park to ourselves, we got to spend a lot of time here. I've been told that people will spend hours in line during busy days. This mama monkey and her baby hung out on my shoulders and arm for at least 10 minutes. At one point, the baby's face was 2 inches from mine. Finally, we headed to the pool and spent the rest of the day at there. You're not supposed to bring your own food into the park, but that never stops me. My kids prefer PB&J to concession stand food (Thank goodness). We had the pool all to ourselves. Part of our admission included transportation to and from the park. Gumbalimba Park provides transportation to and from the park for all of its employees. Since we stayed until closing, we ended up in a van along with several park employees. Tag's favorite memory from this day: "A monkey peed on mommy (yes it really happened). A monkey jumped on me. A macaw stood on me." Normally, we don't like to participate in activities where wild animals are kept in unnatural habitats. Lucky for us, there are many animal friendly options on the island. After some research and talking with the locals, we decided that supporting the operation at Anthony's Key would be a good thing. Best of all, we could make one of Ela's dreams come true. 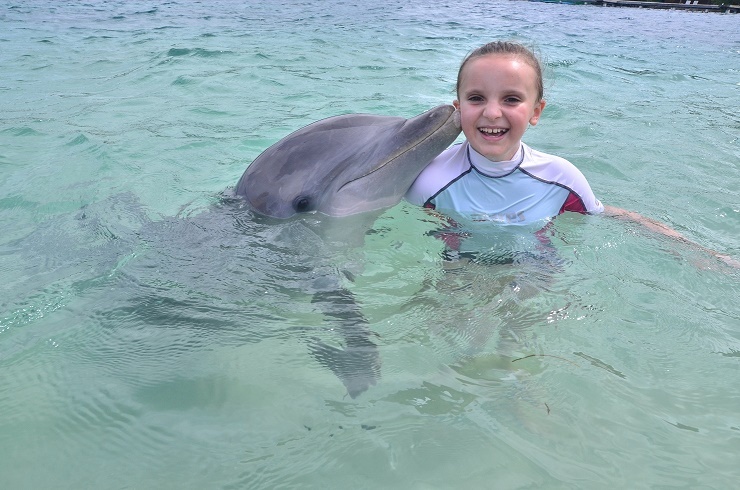 Dolphins have been her favorite animal since she was a young child. Tag refused to get in the water with the dolphins. Really. Are you surprised? So, while I was stuck on the dock supervising him (there's NO WAY we could leave him unsupervised, although the place probably wouldn't have minded), Ken got to get into the water with Ela and the dolphins. This started with the typical "meet the dolphin tricks and kisses". Ela & Ellie, a match made in the Caribbean. Later, Ela and Ken snorkeled with almost 20 dolphins. Ken and Ela snorkeling with dolphins at Anthony's Key. The dolphins have a big habitat. Some dolphins escape and usually return (on their own) within a couple of days. Occasionally, dolphins will escape follow boats to other parts of the island where they happily perform some of their tricks in the wild. Tag and I enjoyed the dolphins from the dock. They were quite friendly and splashed us a few times. We took a water taxi to West Bay to enjoy the beaches. On non-cruise ship days, the restaurants welcome you to enjoy their beach chairs in exchange for buying drinks or food. On cruise ship days, beach chairs cost $20 each. Either way, the sand and water is pristine. We spent one day at a restaurant that served very strong drinks (a bit too strong for me) and enjoyed talking with some Roatan locals. Another day, I took the kids, (again, Ken was working), and we enjoyed the bonus activities that are available when cruise ships are in. Both kids spent hours on the blow up water toy and made friends with other English speaking tourists. Extra activities, for a steep price, are available on cruise-ship days. Bonus: Everyone else had to return to their ship and we spent another hour playing without the crowds. My little pumpkin and I are waiting to take a water taxi from West Bay to West End. It's 10 minutes by boat or 20 minutes by car. The boats only run during day light hours. There was so much we didn't do, and we all hope to return. I'd love to ferry our car to the island and use it to explore without paying the steep taxi fees. There are buses (actually shuttle vans) that are available and cheap, but they often choose to take circuitous routes looking for other fee paying customers. This makes a 15 minute drive last 60 minutes. On busy days, you may have someone sitting on your lap. Roatan can be done cheaply (rent a house in West End during the low season) or it can cost as much as a Hawaiian vacation. Planes land straight on the island, which means you won't have the "scary" Honduras experience. We took the passenger ferry (aka the Vomit Comet) and left our car on the mainland. Fortunately, we were on the early ferries which meant calmer waters. Luckily there was no vomiting although the crew did hand out vomit bags. Will we go back? We hope so, but who knows!